‘Are we there yet ma? I can’t wait to meet Lajwanti’, said an eager Sunita as the bus came to a halt. She hoped this would be the final stop as she was really looking forward to seeing her cousin after a whole year. ‘Yes we’ve reached finally. Please grab your bag and stay by my side,’ said Sunita’s mother while draping her dupatta around her head and stepping off the bus gingerly. This was Sunita’s first visit to Karachi. Though her cousins from the metropolis often visited their home in Tando Jam, twelve-year old Sunita had never travelled outside her small town before. But this wasn’t merely a holiday trip as Sunita’s family was moving permanently to the city of lights where her father had found work in a local plastic-bottle manufacturing factory. The family were glad that the bumpy bus journey was over. Jostled by the crowds, they somehow managed to make their way to the station’s exit. Sunita held on to her brother’s arm tightly and looked around for Lajwanti. She spotted her standing next to a fruit vendor, waving at them frantically. Soon Lajwanti and her father were welcoming the Dhillon family with beaming smiles and hearty handshakes. ‘I’m so glad you’re here Sunita,’ said an excited Lajwanti. ‘You will love being here and I can’t wait for you to meet all my friends.’ Sunita smiled back, equally excited about the prospect of spending time with her favorite cousin and of life in the big city. Sunita’s first week in Karachi went by really quickly. Her uncle took her and Lajwanti to Saddar bazar where he said one could find anything and everything. Their families had a lovely picnic in the gardens around Frere Hall. And the week ended with a long day at the Clifton beach where the children enjoyed camel rides as the adults munched spicy ‘paapars’ and kept watch. After a fun-filled week, It was time for Sunita to start at her new school. She was glad that she would be going to the same school as Lajwanti, even though her cousin was a year ahead of her. On the first day, she stood outside her house waiting for her cousin so that they’d walk to school together. At school, Lajwanti introduced Sunita to her friends and showed her around the campus. She made sure to check on Sunita during lunch breaks as well to help her adjust with her new surroundings. Much to her dismay, Lajwanti noticed that as the days went by her little cousin gradually lost her usual chirpiness. She found Sunita unusually quiet during their morning walks to school and often found her wandering aimlessly around the campus during lunch breaks. ‘What happened?’ Asked Lajwanti worriedly. ‘This is outrageous! We must report this to headmistress Firdaus,’ retorted Lajwanti. ‘But first we need solid proof and I know exactly who can help us get it. Let’s go, It’s time we paid my dear friend Gul Rukh a visit!’ Concluded a determined Lajwanti. ‘It’s six o’clock, hopefully Gul Rukh would have some time for us if we hurry,’ said Lajwanti as she hurried on. Gul Rukh was done with her daily chores and was happy to see the two girls. ‘It’s so good to see you Lajwanti, I haven’t seen you in ages. What have you been up to?’ Lajwanti introduced her cousin to Gul Rukh and took no time to narrate their grievances to Gul. ‘How on earth will we do that?’ Asked an astonished Sunita. ‘Of course we can! I’ll help you collect the samples during lunch break tomorrow’ replied Lajwanti while a nervous Sunita nodded silently. ‘Great I’ll keep everything ready. I’ll see you both at six tomorrow.’ Beamed Gul. Sunita found it very hard to concentrate during lessons the next day. She felt both excited and a bit terrified. She was glad she wasn’t doing this on her own. ‘Come on quick let’s do this before anyone sees us’ whispered Lajwanti to Sunita as the girls slipped in to Sunita’s classroom quietly. Everyone was in the playground and the girls had only fifteen minutes to get their samples before they all came in for lunch. Lajwanti fished out four glass bottles neatly labelled with the names of their suspects from her pocket. She quickly handed three of them to Sunita. The girls then collected a few drops of black ink from each suspects’ pen, making sure to not take too much to avoid raising suspicion. With the samples safely in Sunita’s bag, the girls made their way to Gul Rukh’s house after school. They couldn’t wait to find out more about chromatography and how it was done. 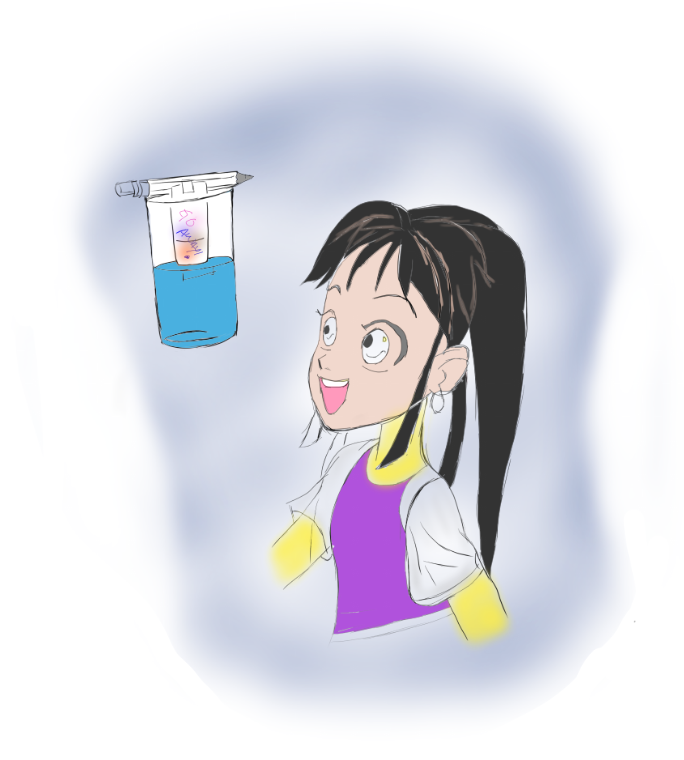 Gul Rukh led them into the basement where she slept and did all the cool science experiments in her free time. She often used these experiments to help out her friends in distress or simply to have fun. She showed them how she had carefully cut out the letter ‘O’ from one of the rude notes. 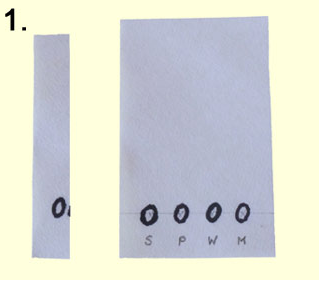 ‘We will now draw matching Os using ink from each of the four samples you’ve collected my friends,’ explained Gul. She carefully dipped a Q-tip, using a new one each time to draw four Os on a piece of filter paper. ‘What will happen to these Os Gul? How can we tell which of these four inks was used to write these horrible notes?’ Asked a curious Lajwanti. ‘Well very few things consist of a single substance as most things are mixtures of different substances. For example, a perfume may contain dozens of different substances, each one of which can influence the overall smell of it.’ Replied Gul. 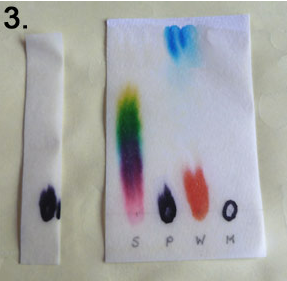 ‘Chromatography is a method of separating out materials from a mixture and it is used for all sorts of purposes, e.g. for checking that our food and our medicines don’t contain dangerous impurities. Also police forensic scientists often use chromatography to identify substances found at crime scenes.’ Continued Gul. ‘Oh and you can see that I’ve labelled each O with the first alphabet from the suspect’s name so that we would know who the ink belonged to,’ added Gul Rukh. The girls watched as the water moved up the paper. 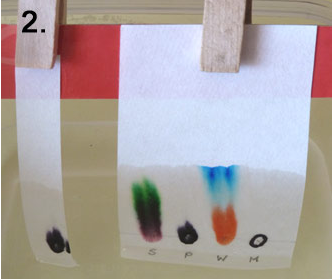 ‘As the water moves up, it mixes with the ink samples and the ink dissolves in water. Together the mixture moves up the paper. But as I said before, black ink is a mixture of different colors. And in a bit you will see how all these different colors will separate out from our samples of black ink,’ continued Gul. ‘But what if the note had been written using a permanent marker? Ink from a permanent marker doesn’t dissolve in water, how would we have separated the ink then?’ Asked Lajwanti. Lajwanti and Sunita looked impressed, they thought Gul Rukh was amazingly clever and cool to know all this and that too even without going to school. After a few minutes the girls dried the papers off and compared the ink patterns. It was easy to see which ink pen had been used to write the note. They now had their proof. The ink on the note matched with the ink sample labelled P which had come from Pervaiz’s pen. The next day, Lajwanti stormed into Sunita’s classroom just as the bell for lunch break went off. Sunita watched nervously as her cousin strode up to Pervaiz, the tallest and scariest boy in her class. She held out the notes and looked at him questioningly. ‘Can you explain these?’ Asked a livid Lajwanti.’And before you deny writing these let me tell you that we can prove using chromatography that these were indeed penned by you,’ she added. ‘Using what? What is chromatography?’ Asked a puzzled Pervaiz. ‘Never mind that, I will report you to headmistress Firdaus if you don’t own up to these and apologize to my cousin Sunita. You and your group of friends must stop harassing her. Stop being mean to her because she’s different than you. She comes from a different faith than you but she has feelings just like you. You wrote insulting things about her and her faith on these notes and you’ve made her life hell by not allowing anyone to befriend her. You must stop and let her be. You’re not being cool, you’re being cruel!’ Said Lajwanti with hurt in her voice and tears in her eyes. Pervaiz couldn’t bear to look into her eyes. Nobody had confronted him in this manner before. All the boys around him, particularly his elder brother Nasir had always told him that bullying and laughing at others would make people fear and respect him. But right now all he felt was humiliation. He looked at Sunita, cowering behind her desk and felt even more humiliated at his behaviour. He walked up to her and murmured an apology before quickly exiting the classroom. Sunita looked at her cousin who seemed equally astonished at the fact that they’d managed to get the message of love and peace across to one of the scariest bullies in their school. They just couldn’t believe it!